I didn’t use to frequent this place as a teen or early twenties guy though there were occasions when I did grace here with my presence on one of my drunken escapades. I’ve even been known to find love, or something akin to it, between the walls of this establishment. 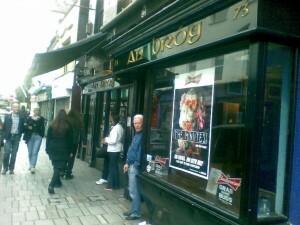 The entrance is the same but it has extended over the years and while including the old corridor to the bar, now the back bar, on the immediate left is the daytime, regulars, quarter. That it has undergone many changes in my time travelling only serves to confuse me every time I return, especially when in search of the Jacks. Good old soul music creeps across the room, not out of place among a select group of settled individuals, and the seating is damned cosy. It’s greatest failing is the stink! So oft before a semblance of stale beer and cigarette smoke, then body odour post smoking ban, these days it has surrendered itself to the illusion of cleanliness as only air fresheners and toilet trough soap can do. There could even be a compromise at furniture polish – this place is afterall a pyromaniacs dream, all wood and red leather (maybe plastic?) cushioned seats. The only thing to survive would probably be the bare shell, the fire brick, though considering the aging that has been absorbed through sweat, tears, beers, tar, these too may have found themselves more similar to the black seam these days. Now I’m not condoning arson and I’d be disappointed if it were to come to that cos this place does hold memories…and not only of the stink! It is an institution in the minds of many’s the Corkonian, it’s a late night bar made popular by the hordes of foreign students that pile in over the summer months, and the gargle is cheap. But BE WARNED! This latter benefit is a daytime treat. Like some Cinderella-esque affair this place turns after 11pm into a pricey place; being downtown Cork and being one of the few late night bars, it can do it, so you’d better be able to afford it. That said, it could never be as dear as some, even after the fairy-god price has vanished. But if the pocket doesn’t seem as deep as it used to be then get in early, find a seat, phone a friend and let 11pm alone till 11pm comes. Then make your further choices. Note: If hungry, even for crisps, avoid the place, cos you know how it goes: you’ll stay for one, pause for two and continue, not wanting to give up the seat and the comfort, and while you’re thinking over beer number three whether to run to the chipper, beer four and five will be pressing. Finally you’ll end up pissed, still hungry, but God willing you’ll still be able to get a feed in before 2 am, or at least wake up beside some it, a mess of chips and curry across the floor, the bed, in the face and in the hair. Now I’m only saying: This COULD* happen! P.S. Crosswords are available, photocopied cut outs, on the tables for the early-birds.